It all started last week when my shipment of diapers from Kelly's Closet arrived. I had coupons for two free diapers (yay! ), so I tore the box open to see what brand my freebies were. Boo! They were both the same brand, and the same brand freebie I got last time! Even though this particular brand gets rave reviews, it has too many parts for me. Given my new found love for de-cluttering I knew these couldn't stay around. I had already mailed the first one off to Bethany, so I asked Twitter if anyone wanted these two freebies. Within minutes Arwen wrote back saying how much she'd love them. The next day I went to the post office to mail them and then drove to play group. As I walked into the house, the host mom was giving away several boxes of breast milk storage bags. Being an exclusive pumper, I quickly jumped on the opportunity. This made up for my disappointing free diapers. Earlier this week I was out walking with Megan who is due with their third in 2-3 weeks. She is busting out of her size medium maternity clothes. So I went home and packed up all my size large for her to borrow. While I was packing I got a phone call from a different girlfriend whose 13 month old is weening off formula. She said her husband is a bit of a horder and bought too much at their last Sam's Club trip. She wanted to know if we'd like it, for free! Well, of course! We are starting to give Evie a bottle of formula a day to see how she tolerates it to determine how much longer I keep pumping. 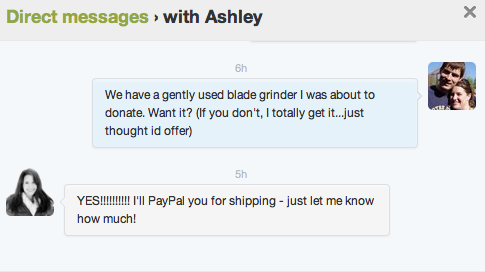 Then today I saw on Twitter that my friend Ashley's coffee grinder broke. When we returned home from play group this afternoon there was a box sitting on our doorstep. It wasn't the package I was expecting today. Three times in one week I gave without hesitation or expectation and was more then abundantly blessed in return. The Lord continues to humble me! 'Like' - so awesome! God is good! Do you know where this statue was purchased? It is stunning!